Between Schneeberg and Zwickau in western Saxony is a small town of Kirchberg. With a population of 8,700 inhabitants, Kirchberg straddles the Rödelbach River, which empties into the Zwickau Mulde River in Wilkau-Hasslau, approximately five kilometers north of the town. In addition to that, Kirchberg is known as the City with Seven Hills, as all seven hills surround the small community, protecting it from the weather extremities, especially in the winter time. Yet it is most difficult to get to the next available towns because of the winding roads one needs to go through. And Kirchberg is one of the most expanded communities with the least population density in Saxony, for 12 Kilometers of area in all directions belong to the community, including all of the small suburbs. While Kirchberg has a rather historic but sleepy town center (because buisness usually closes at 3:00pm on weekdays, non on Saturdays), a church on the hill and a couple notable historic bridges along the Rödelbach, one bridge in particular is the focus of this article because of ist unusual design and a classic example of a restored truss bridge. The Sonnebrücke Truss Bridge spans the Rödelbach on the east end of Kirchberg (see map below). The bridge, built in 1882, is unique because of its unusual design. For instance, the bridge is a pony truss built on a 45° skew. The skewed formation is easy to detect because one can see it from the main highway on ground level and from the hillside on the north bank of the river, it resembles a shoe. The harder part is identifying the truss type for from a distance, it appears to be a bowstring arch span. Yet when taking a closer look, the bridge is actually a Parker pony truss, mainly because of the slight bends of the upper chord per panel. 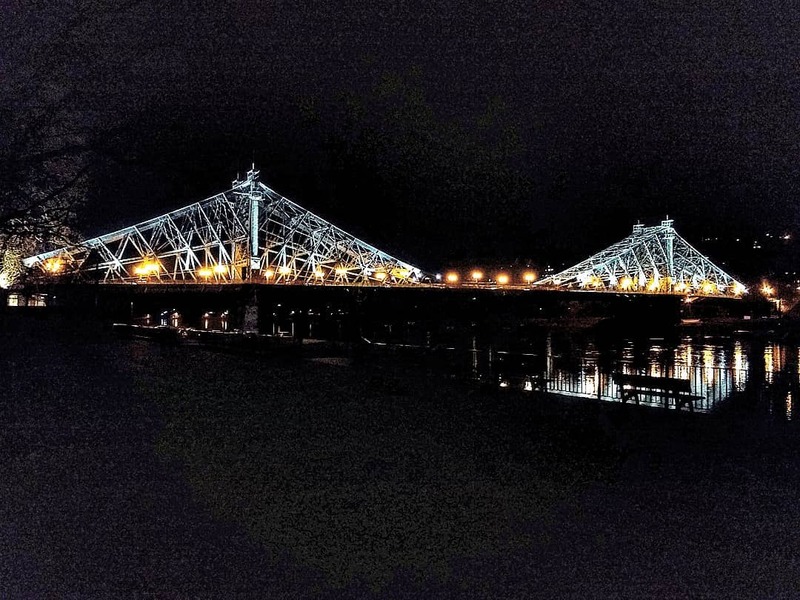 The 24.5 meter truss bridge has nine panels with the highest panel being 1.7 meters tall. How the bridge was built is the most difficult of all because you can only see the details up close while on the bridge. For instance, the bridge has welded connections, meaning that the beams are attached with gusset plates and welded nails. Given its age, this type of practice was first introduced in the 1880s and the Sonnebrücke is one of the first bridges built using this type of practice. It is one of the rarest bridges whose upper chord consists of a rare type that is seldomly found in truss bridges. While most truss bridges used H, I and T beams for their upper chords and end posts, this one has upper chords whose parts consists of L-shaped beams welded together making it appear like a cross-shaped beam. No truss bridge in the eastern half of Germany has such an unusual chord like that. It is even rarer when compared to the American Phoenix column, which was used on many iron truss bridges in the 1870s and 80s and has round-shaped columns with 4-8 points in the corners. The Kingdom of Saxony authorized the construction of the Sonnenbrücke in 1882 as part of the railroad project connecting Wilkau-Haslau with Carlsfeld via Kirchberg and Schönheide near the present-day Eibenstock Reservoir. From 1882 until its discontinuation in 1967, passenger and freight trains crossed this bridge daily. It was one of 54 bridges that the line went over, which included six viaducts in and near the Mulde River. Even though the line was discontinued in its entirety by 1980, the Sonnebrücke is one of only a handful of crossings remaining on the line, which has been dismantled in large sections but abandoned on other stretches of track, including the line between Schönheide and Carlsfeld. When the line was discontinued in sections and tracks were taken out, all the bridges and viaducts were removed with steel parts recycled for other uses. Attempts to save some of the viaducts were put down due to lack of financial resources and pressure by the East German government to support the communist system by making use of every resource possible. The Sonnebrücke remained hidden from view for another 40+ years until city officials collaborated with locals and a pair of restoration companies in Saxony to restore and repurpose the structure for recreational use. This happened in 2014 at a cost of 90,000 Euros. There, the bridge was sandblasted and repainted black, some parts were replaced because of the rust and corrosion, and a new flooring made of wood replaced the rail decking which no longer served its function. Today, the Sonnebrücke continues to cross the Rödelbach River but has a new function, which is to provide cyclists and pedestrians with an opportunity to explore the town along the river. This bridge and another crossing at the Hauptstrassebrücke are both part of the former rail line that had once had trains going through Kirchberg, stopping at two stations in town. Today, it carries as a bike trail and even though only a section of the former rail line is used as a rails to trails, the Sonnebrücke and the line that crossed over serves not only as a reminder of a railroad that had once been part of Kirchberg’s history and heritage but also as an example of an unusual truss bridge which had long since been forgotten but the city took care that it received a new purpose in life. It definitely shows that even with a small portion of money, one can make use of it and make it like it was brand new.